Ferdinand Marcos had the dream of becoming the most powerful Filipino, even admitting that he wished to have a military dictatorship long before he declared martial law as president of the Philippines. He planned his steps like a general would, leaving no stone unturned. 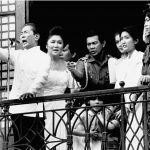 Primitivo Mijares, who worked for the Marcos family as chief propagandist, wrote in his book “The Conjugal Dictatorship” that his wife, Imelda, had a hand in making Marcos’ aspirations become a reality. The former First Lady shared political powers with the dictator during Martial Law. 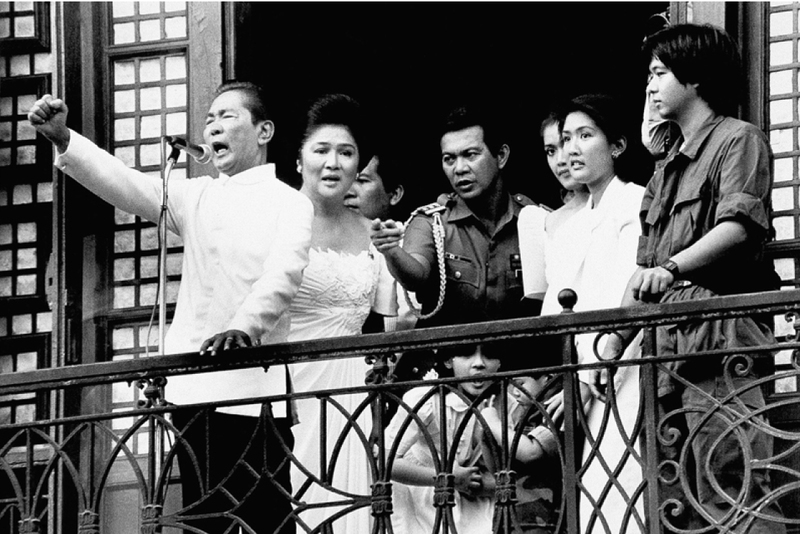 Ferdinand E. Marcos with his wife, Imelda at his side, gestures strongly from the balcony of Malacanang Palace on Tuesday, Feb. 25, 1986 in Manila, just after taking the oath of office as President of the Philippines. Just hours later, Marcos resigned and fled to the U.S. Air Force’s Clark Air Base, 50 miles northwest of Manila, as he prepared to accept an American offer to fly him out of the Philippines. Veronica is the daughter of Carmen Navarro Pedrosa, journalist and author of the “The Untold Story of Imelda Marcos,” which narrated how the First Lady, although a Romualdez, was not born into wealth. The Pedrosas were forced into exile after the book’s publication. Imelda had a flair for hosting grandiose events. In 1974, for example, she reportedly tapped the president’s contingency funds, military’s intelligence fund, trust funds of the Government Service Insurance System, Central Bank, Philippine National Bank, the Social Security System and the Development Bank of the Philippines to host the Miss Universe pageant in 1974. The Philippine leader then appointed his wife as the governor of the Greater Manila Area in 1975, integrating four cities and 13 municipalities into one government. Imelda announced her grand plans to transform Metro Manila by transferring all government offices to a reclaimed area, build an international trade center and improve the Manila International Airport, among other plans. The US Department of State said in a now declassified cable that for the airport project alone, the Asian Development Bank granted a loan of $29.6 million. “If even a fraction of what Mrs. Marcos proposes really does take place, it would mean enormous expenditures of resources and their diversion from rural development,” Washington noted in a now declassified document. 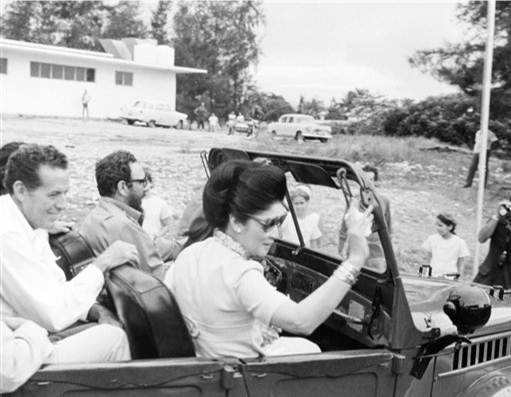 Imelda Marcos rides in an open jeep driven by Cuban premier Fidel Castro during a tour of a youth camp outside Havana, Cuba on Thursday, Aug. 28, 1975. To top her array of duties as First Lady, assemblywoman, and Manila governor, Imelda was awarded a new Cabinet position for “human ecology and settlements” despite the expression of concern of assemblymen-elect that she first had to resign as governor of Metro Manila. She didn’t. “Exactly what functions the new department will perform are not clear. It appears, however, that it may find itself competing (and probably successfully) with already establishing agencies, e.g. the Department of Local Government and Community Development, for control of other development programs,” another declassified U.S. State Department file stated. “Imelda was the privileged dictator’s wife, Assemblywoman, governor, Cabinet official, envoy and hostess. Imelda was the privileged dictator’s wife, Assemblywoman, governor, Cabinet official, ambassador plenipotentiary, and hostess. Imelda enjoys the pomp and ceremony of international occasions, and has even attempted to invite herself to the Nixon inauguration in 1968 and the dedication of the Sydney Opera House, where she made an effort to upstage the queen, declassified US diplomatic cables posted by WikiLeaks showed. A Dec. 23, 1976 cable of then US Ambassador to the Philippines William Sullivan raised questions on the claim of Imelda that she was invited to the inauguration of newly elected US President Jimmy Carter. The adjective “Imeldific,” moreover, was a rare contribution of the Philippines to the English language, referring to the excesses of Imelda. Merriam Webster Dictionary defines it as “ostentatious” and “extravagant,” as the world saw Imelda’s fashion, travels, parties and projects. The eldest of the Marcos children, Imee was the first of the children thrown into politics. In 1975, at 20 years old, she was given by her father the position of chair for the newly created Kabataang Barangay. The appointment raised eyebrows as she was already too old for a group whose members’ ages ranged from 15 to 18. Imee met a challenge in 1977, however, when 21-year-old Mapua student Archimedes Trajano spoke up at a forum to question her leadership. Frank Senauth detailed in his book “The Making of the Philippines” how Trajano was forcibly taken by Imee’s personal bodyguards from the Pamantasan ng Lungsod ng Maynila venue. The young man disappeared, only to be discovered dead later on. Trajano was reportedly told that her son got into a dormitory fight. A district court in Honolulu, Hawaii ruled, however, that Trajano was beaten and tortured. The same court ruling awarded $4.16 million to the Trajano family and an additional unspecified amount for lawyers’ fees. “Despite being formed in 2002, thirteen years after the death of Ferdinand Marcos, Sintra Trust has parallels with the Marcos foundations set up in the early 1970s in Liechtenstein,” the Philippine Center for Investigative Journalism wrote. A “viral video” would be unheard of in 1986, but home videos discovered at Malacañan Palace after Marcos was deposed might have met today’s standard of success on social media. US-based CBS News aired clips of a party aboard the presidential yacht where Ferdinand Jr., known as Bongbong, was seen dancing and singing with friends and family while wearing a flashing red bow tie. The Marcos family was discovered to have hosted extravagant private parties for their relatives, friends and associates. At the height of their power, the Marcoses transformed Palawan’s Calauit Island into a zoo through world-class trapper Tony Parkinson and uprooted 254 families living there. The island became known as “Bongbong’s Safari Park” after the president’s only son flew in twice to hunt wild boar, the Los Angeles Times reported. Bongbong himself admitted doing so in an interview with Bloomberg in 2013. Bongbong also became governor of Ilocos Norte until his family was booted out in 1986. He was 28. At the wake of the EDSA revolution, Bongbong was reported to have sat as chair of telecommunications empire Philcomsat in 1985, earning between $9,700 and $97,000 even though he “barely visited the office and apparently had no duties there,” reported Ann Scott in 1986, citing audit documents and unnamed sources. Philcomsat was a known crony corporation linked to the Marcoses. 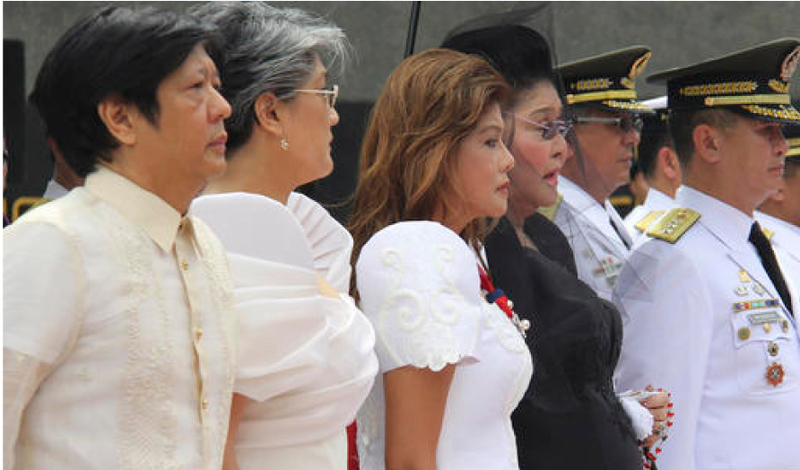 Marcos family in 2016 at the controversial burial of dictator Ferdinand at the Heroes’ Cemetery in Taguig. Shortly after announcing his run for vice president in 2015, Bongbong admitted that the move disappointed his mother, Imelda. “She’s wanted me to become president since I was three years old. Imagine how disappointed she is,” he was quoted by Reuters as saying. Irene, the youngest child of Ferdinand and Imelda, was 21 when she married Gregorio Benitez Araneta from an influential Spanish-Filipino clan in a lavish ceremony. It placed the sleepy town of Sarrat, Ilocos Norte, the birthplace of Marcos, at the center of attention. Observers noted that the “wedding of the century,” which Imelda spearheaded, was meant to rival Prince Charles’ and Princess Diana’s nuptial. Irene chose to rebuild the ruins of Sta. Monica, considered the biggest church in Ilocos, as Frank Cimatu wrote in 1998. Irene was “described by her mother, Imelda Marcos, as the most romantic of her children,” Cimatu added. In 2015, the massive Panama Papers leak revealed that Irene and her husband have a stake on an obscure entity in the Caribbean established through Panamanian law firm Mossack Fonseca. “The International Consortium of Investigative Journalism says vast trove of leaked documents detail the offshore financial dealings of the rich and famous. It includes nearly 40 years of data from the Panama-based law firm, Mossack Fonseca. Shortly after the leak, police raided the firm’s offices in Panama, El Salvador and Peru. While it is legal to maintain offshore entities, they could also be used for illegal or at least unethical activity. “The [Panama Papers] show the myriad ways in which the rich can exploit secretive offshore tax regimes. Twelve national leaders are among 143 politicians, their families and close associates from around the world known to have been using offshore tax havens,” the Guardian wrote, describing the firm’s leaked files. Several names of the country’s wealthiest were found in the leak.